1. Cook the gnocchi in boiling water for 3 minutes, drain and return to the pan. 2. Meanwhile, heat the oil in a frying pan and fry the vegetables for 3 minutes, add the sauce and cook for a further minute. 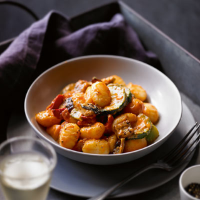 Stir into the gnocchi and serve in wide rimmed bowls.